Subscribe to the Thomas-Steele Blog! When it comes to ensuring the long-lasting beauty and durability of your commercial site furnishings, the e-Steele™ metal finishing process used on Thomas Steele products stands apart from others. The process used on almost every single piece of steel used by Thomas Steele produces a finish that resists corrosion for a longer period of time and improves the overall appearance. The result is Thomas Steele's ability to produce outdoor commercial benches, tables, litter receptacles and planters with smooth, uniform finishes that are able to withstand scratching, impact, chemicals, humidity and high levels of corrosion from salt. This process surpasses the performance of conventional paint top coats. It's also what allows Thomas Steele to offer a five year warranty on its finish from defects like chips, rust, peeling and cracking. This level of durability is accomplished through a unique two-step finishing process. First, the steel is applied an undercoat through a state-of-the-art e-coating that uses an epoxy resin water-based paint. Next, an electrostatically-applied polyester topcoat is applied to the site furnishings. The e-coating and elctrostatic polyester topcoat combination gives the Thomas Steele site furnishing products ideal protection and performance abilities for installations in even the harshest environments. E-coating is a method of using electrical current to deposit organic paint on a metal surface. It is based on the fundamental physics principle that opposites attract. First, the metal parts of the site furnishings are charged with a direct current. They are then immersed in a bath that has oppositely charged epoxy paint particles in it. This allows every corner, crack, and crevice to have a continuous, even coating over the entire surface of the part. Even corners, edges, and recessed areas are completely protected. E-coating is ideal for steel parts of all shapes, sizes, gauges, and grades because of an inherent property called "throwpower." This is the ability to throw paint into recessed areas leading to 100% part coverage. Making site furnishings that have gone through the e-coating process more resistant to chipping, scratching, rusting, and similar issues. This is important because areas of site furnishings that are not properly protected are the parts most susceptible to rust and corrosion. E-coating is also an established process. It's used on many commercial products. In fact, approximately 99% of all new cars manufactured are e-coated then top coated with the color of choice. Epoxy e-coatings, like the one used in the e-Steele™ process, are the global benchmark in demanding environments where corrosion resistance must be maximized. The e-coating process produces little or no HAPs (hazardous air pollutants), ultra-low VOCs (volatile organic compounds), and is OSHA and EPA compliant as well. E-coat systems recycle, too. Virtually all unused paint is recovered and put back into the system. After e-coating, the site furnishings are then powder coated for a uniform, durable, high-quality, and attractive finish. The application process involves applying a charge to the dry powder particles and spraying them onto the oppositely charged steel pieces. This allows the powder coat to cover every crevice and crack. The spray process takes place inside a booth designed to contain oversprayed powder, making it possible to collect the overspray and ultimately recycle it for reuse. After the powder is applied to the steel, being attracted and held by the opposite charge, it passes through a bake oven where it is melted and cured into a smooth coating film. When it comes out of the oven, the site furnishing is uniformly coated and has the cosmetic advantage of no drips, runs, or other common coating defects. Not all steel used in site furnishings are finished the same way. The e-Steele™ process achieves performance and surface protection for site furnishings that can withstand years of service in the harshest environments. 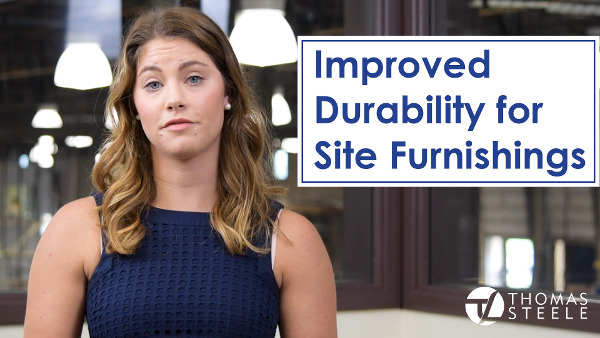 What level of durability is expected from the site furnishings you're selecting? Leave your comments below.